The well attended and organised 34th Norwich Half Marathon splashed off to a slightly early start – at least by my watch – on the 7th. 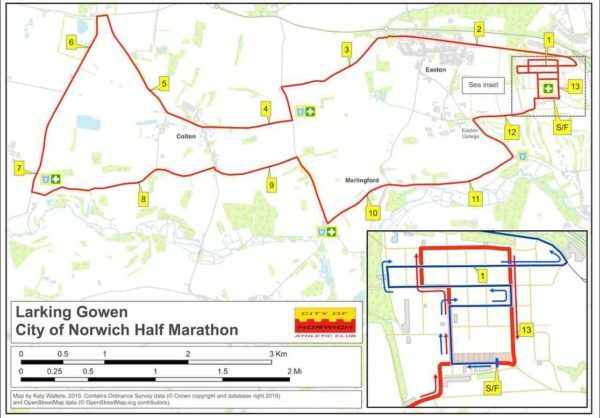 The course starts a little oddly with a potter around the Norwich showground which, it turns out, is easily big enough to absorb the first mile. You then go along mostly quiet (and closed) roads before returning to another, different, circuit of the showground. This year the weather played a part; it started raining a bit, then stopped, then rained a bit more heavily, then eased off, then threw it down for far too long. That was just the first kilometre. After that we had all sorts of showers and whatnot and the inevitable warming sun just as I was finishing. To add to the fun, there was the occasional cold breeze which elicited the inevitable squeals of delight (or the opposite) from the runners. The support for this race was truly epic; folks – often barely recognisable as such in their waterproofs – turned out to cheer us on at various points on the course. The marshals got in on the act too in a couple of cases, although they may have simply been trying to avoid drowning. 1737 runners took part with Piers Arnold (City of Norwich AC, perhaps appropriately!) winning in a good time of 01:07:41 – some 5 minutes ahead of everyone else. First lady home was Mabel Beckett of the same club in 01:20:09. The full results are here in various formats. Two Striders finished the race – sorry for raining on your parade a bit, Rosie!